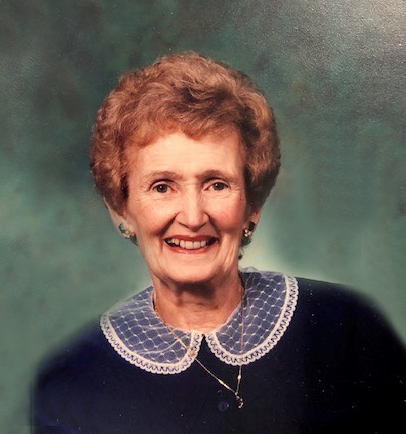 Edna Metzger passed away peacefully on Monday, April 8, 2019 at the age of 101 years. She was predeceased by her husband Glen and her son Gregg as well as by her sisters Ethel, Lois, Beverley and Dorothy, and her brother Charles. Edna is survived by her daughter Carol Anderson and her son Roger (Ruth), as well as by 11 grandchildren, 15 great-grandchildren and 2 great great-grandchildren. Edna was raised in the Wrentham and Warner area. She married Glen on April 8, 1942 and together they farmed for many years on the family farm near Stirling. In 1973 they moved to Lethbridge. Glen passed away in 2009 and in 2015 Edna moved to Golden Acres Lodge. Edna was a member of the Daughter of Nile. She also joined a bowling league after moving to Lethbridge. She always put on an excellent Christmas dinner, being the great cook that she was. She also was a very meticulous home keeper as every item was in its place. Edna also enjoyed playing cards and working with her flowers. The family would like to thank the lodge staff for the kind care they provided for their loved one. A Come and Go Celebration of Life will be held at 1:00PM, on Monday, April 15, 2019, at COUNTRY KITCHEN CATERING, 1715 Mayor Magrath Drive South, Lethbridge, AB T1K 2R7.